Does your Computer regularly freeze and are you sick and tired of this ? Are you Running Out of the Primary Memory and are you searching for something that increase your computer speed i.e RAM and that too without investing much ? Then you are at the right place ...! 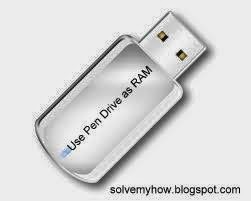 Today I'm sharing one Trick that " How to Use Pen Drive as RAM " . Firstly, you might be thinking that is it really possible or it's just a prank ? Well, answer is hell yeah, this is Possible. So, let's increase your Computer Speed by following the basic steps . Step 1 :- Firstly, Insert your Pen Drive and let your computer read that and Now, Simply format it to utilize it fully. Just Select your Pen Drive by going in " My Computer " then Right Click and Click on Format. 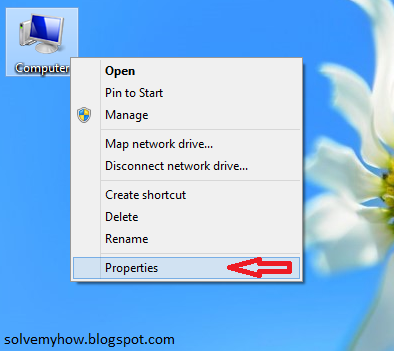 Step 2 :- Right click on " My Computer " then go to " Properties " . Step 3 :- Now, the new window will be open called " System Properties " in that you will see the different different options like Computer name, Hardware, " Advanced ", System Protection and Remote. Just Click on " Advanced " Option. 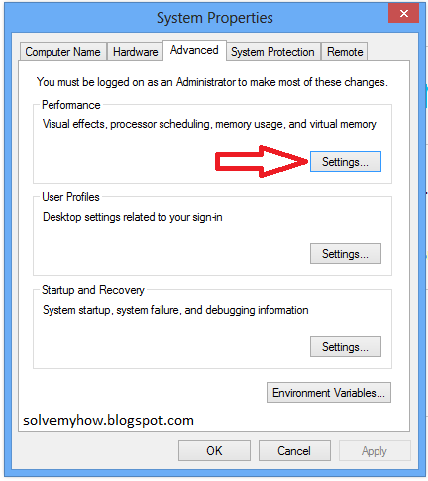 In case you're using Windows 8 then click on " Advance System Settings ". Step 4 :- In " Advanced " Click on " Setting ". 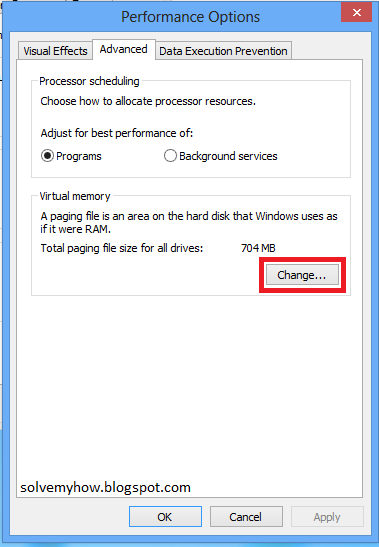 Step 6 :- The new window will be open " Virtual Memory ". In that just select your Pen drive . Then, just select the " Custom Size " Radio Button . 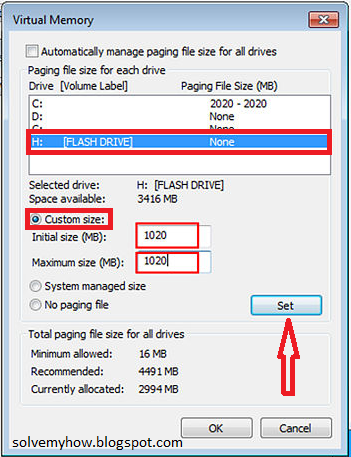 Now, the last thing you need to do is to set the size which depends on the free available space in your Pen Drive. In my case I set it to 1020 and you can set it accordingly . After doing so just hit " Set " . Step 7 :- Now, the System will ask you to Restart the System/Computer just blindly hit " OK ". That's it you're done now. When you restart you Computer the Speed of the Computer will be Increased. Just remember one thing when you restart your Computer do not remove your Pen Drive . This is create a virtual RAM, that is ok, but what if i want to use my pen drive for storing the data after using it as a Virtual RAM ? is this a one way process ? No you can still use it as Pen Drive, Just undo all the Process you've done to Use your Pen Drive as RAM ! Glad to help you ! I would also suggest you to read our Blogger Category to get more and more traffic on your blog. in the 'virtual memory' dialog box my computer is not displaying pendrive. Remove all other plug in devices and then try it. It can be the reason. My ram is 1 gb , if i use 8 gb pen drv in this proces , my ram will be 9gb ? Thanks for stopping by. Nilam this will act as a virtual RAM so technically yes this will make your RAM 9GB. hey,it means it will enhance the RAM in terms of the program loading and execution.Also,helpful while playing heavy games.Could you give detailed information about the effect of low Graphics card and on the other hand,i have increased my RAM.What will happen then,my game will play smoothly or it lags.Please suggest ?? Thanks for stopping by. Jimmy yes these all things will become possible with this virtual RAM. But just remember this is not your actual RAM so once you remove your pen drive it will be gone.